Stefani Greenfield is a true style expert with several successful businesses under her belt. She is the co-founder of Scoop stores and was recently made Chief Creative Officer of the Jones Group. Stefani certainly knows a thing or two about effortlessly combining uptown chic with just the right amount of downtown cool. Check out some of her fabulous picks and tips on how to seamlessly “successorize” your spring time style. Look 1: Vibrant Patterned Scarf – A bold, bright colored scarf is the perfect complement to any neutral dress this spring. My personal favorite is the Splendid maxi dress. The Theodora & Callum Jaipur Fringe Wearable Art Scarf will take your basics from ordinary to extraordinary! Finish off the look with some fabulous jewelry like the Theodora & Callum Silver/Brass/Gold Salon Bangles. For me gold bangles are a staple in my wardrobe, they can be thrown on with any look, in any climate and any time of year. Have fun mixing patterns and pair the outfit with these Theodora & Callum Orange Bali Espadrilles! Theodoraandcallum.com has some incredible tutorials on interesting ways to wear your scarf. Check out our Ways to Wear videos to take your scarf from street to beach and beyond. Support Earth Day. Ask Melissa loves this series of limited edition eco-friendly t-shirts designed by Tonic for Donna Karan’s Urban Zen. 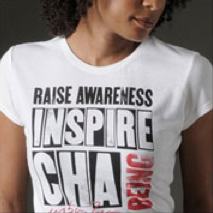 Proceeds of these bamboo and organic cotton t-shirts are donated to both the Urban Zen and Tonic Foundations.